I was about to tuck myself in for a nice, really long torpor session with a cozy stake through the old tired beatbox, when I suddenly felt a tingeling sensation in my veins. The eternal hunger quaked through my body, and I came to the conclusion: I have more fish to fry. There are still some old enemies to teach a lesson! Some ousting is left to do! Can you also hear the battle call of the Founders? Just when I thought I was out, they PULL me back in! … and this time is for real. 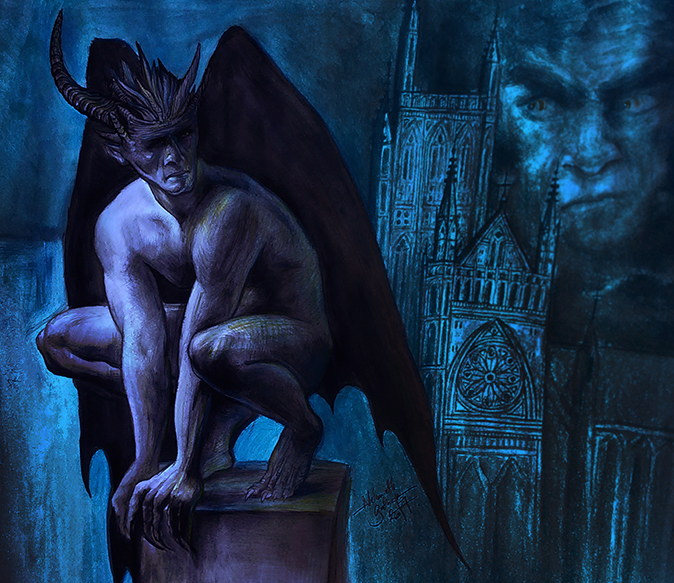 Black Chantry Productions has been alloted the license from White Wolf Entertainment to produce Vampire: The Eternal Struggle, both reprints and brand new cards. Not much has been disclosed yet, but the titles of five products were stated in the first press release. If you haven´t done so, please also visit Blackchantry.com. Products are being revealed really soon, but while you are waiting, have good look at the Lost Kindred set symbol and the preview card above. Symbol design by Ginés Quiñonero and artwork by Gábor Németh. Radoslaw Szewski is the head organizer of the European Championship 2018 to be held August 24-26 in Warsaw, Poland. We asked him some questions. How are the preparations going? - I'm in the middle of the process right now. My goal is to be able to present everything at the end of May. Prizes, judges, sponsorships deals – everything is important and time is running out. You know, I'm quite a busy man: family, job, my band Zombie Strippers from Hell... But my friends know that, because of my ADHD, I like to do different things one at a time. Do you have any problems? Anything attendees need to think of? - No. From the travel/booking perspective everything is just fine. I know the hotel staff, so there will be no suprises, I hope. The hotel is big enough for everyone – I chose the date for one particular reason: the hotel is empty at the time, so we will have plenty of space for VTES. And in summer the weather should be fine. Warsaw by night is really great, but I suppose everyone will just play VTES. You have organised the EC before – what will be new this time? - Yes, I did it twice before. This will be my last EC as an organizer for sure, and for me it will be a very sentimental journey. I want to meet all my VTES friends from all over the world and spend some time with them. I have lots of memories and I want to share them – and get some new! Also, I have a few different things for the players, but I can´t speak about them right know. Sure there will be t-shirts for the entry, as always, but that´s all I can say at this point. I'm in talks right now with a few parties ... and that´s all I can say. How are your feelings about VTES finally being printed again? - It´s good that my beloved game will have a chance to conquer the world again! VTES definitely needs fresh blood – a new, young generation of players. And I'm very proud that my friends are behind this revival. Long live VTES! See ya during EC 2018! No less than two European Grand Prix tournaments were played this past weekend. VEG Madrid was won by Raúl Olvera playing Assamite Black Hand stealth-bleed and VEG Budapest was won by Dávid Farkas playing Fakir al Sidi rush/wall. We will return to report about these events in the next newsletter, with TWDs and hopefully also interviews. Congratulations champions! 20 players from 6 countries, approximately 6 man-hours of delay due to 2 traffic jams, 9 game wins in 13 games, 1 coin flip, and 21 good man-days of VTES. 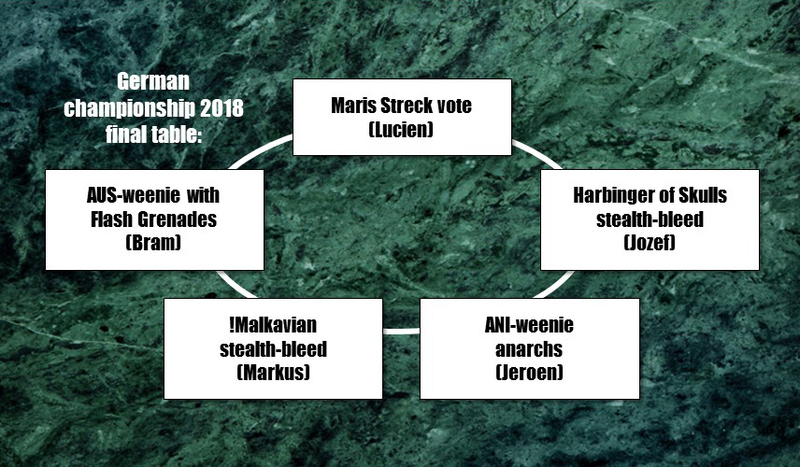 That, in a nutshell, is the result of the German Championship mid-April 2018. • There was a random prize support giveaway, where one player had the chance to win a print of the artwork from the card Danielle Diron (Advanced), signed by the artist, Carmen Cornet. So the print, sent from Spain to Germany, was then won... by the only Spanish player in the event! • After the preliminary rounds, there was a tie for 5th place between two players. Ali Almadhi won his seat in the finals in a coin toss against Bram Van Stappen... but then recognized that all other players who had arrived in the same car (and who had already spent quite some time in a traffic jam that morning) would need to wait for him for their trip home. Thus, Ali gave up his seat to Bram. Sportsmanship! Interesting table discussions, some players heartily regretting their choice of seats, a quite long time with 5 players at the table... before, in the end, after approximately 1 hour and 20 minutes, everything collapsed, when Lucien annihilated the table with Anarchist Uprising and Ancilla Empowerment. The first vote removed something like 27 pool from the table, ousting three players simultaneously: Jozef, Markus, and Bram, so that Lucien, Jeroen and Markus had 1 victory point each. The final fight between Jeroen's weenie horde and Lucien's high-cap royalty did not last long: Lucien managed to get Ancilla Empowerment in hand, and made Jeroen pay for the decision to play weenies that day. So Lucien won the finals with 3 victory points. Quite spectacular! First, a comment from Bram Van Stappen, who originally built the deck played by Lucien: "Hey Hardy, the deck is from my hand. I played it once or twice on Lackey. Inspired by a deck from Marius. Lucien played Maris/Lutz before, but this was the first time he played this deck .... thanks again for a nice tourney!!!" We know that many of you are also interested in Vampire: The Masquerade, so we want you to notice that our friends at White Wolf now have made Fifth Edition available for preorder on www.modiphius.net. Looks awesome! "Vampire: The Eternal Struggle has always been a one-of-a-kind. It is a game that defies established genres and has held its own for decades, a testament to its genius and original design. We at White Wolf are proud to be a part of the revival of what can truly be considered a classic”, says Karim Muammar, Creative Development, White Wolf Entertainment. Some of us V:EKN volounteers have been getting these strange, identical letters lately. A paper stuffed in a simple brown envelope, postmarked UK. 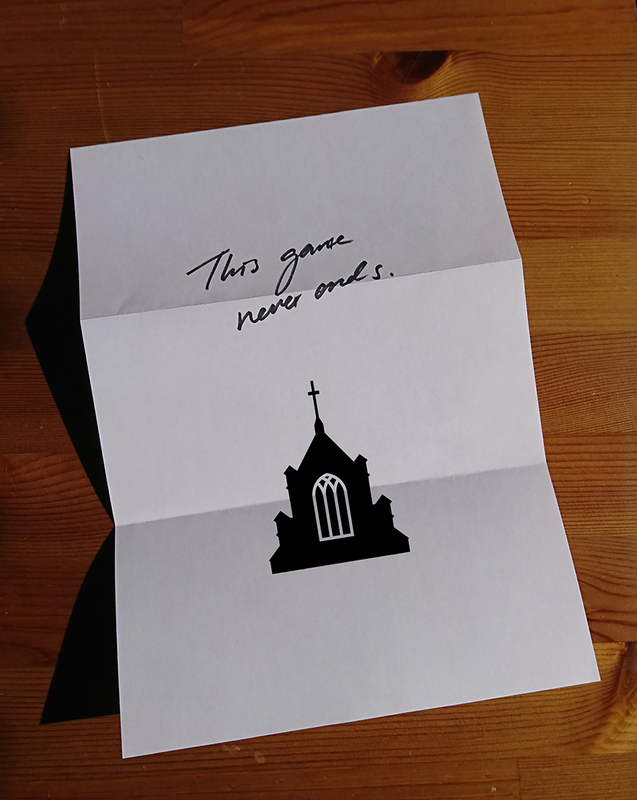 Just one sentence: “This game never ends”, followed by a mysterious symbol. It´s a bit threatening, but mostly compelling. Do anyone of you know what it is about? Can you guess? The V:EKN wants to remind you of that, as announced in last month's newsletter, three rules changes are in effect as of April 2. 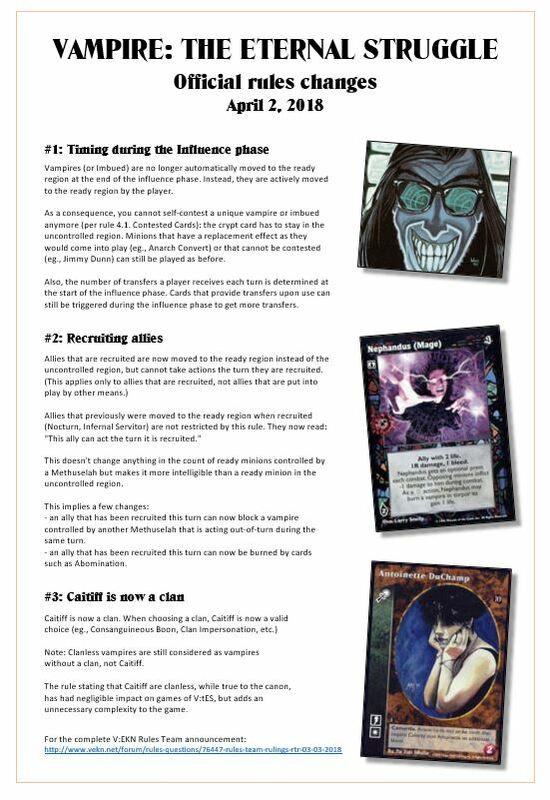 They are about influence phase timing, recruiting allies and Caitiff as a clan. Above is a pretty PDF presentation for you to print, frame and nail above the gaming table. As usual, the easy way to ask questions about the rules changes is to post a topic about the specific rule on the VEKN.net forum, under "Rules Questions". EC 2018 WARSAW REGISTRATION IS OPEN! Registration for this year's largest V:TES event is now open, and once again it is the beautiful Polish capital of Warsaw, which is hosting us August 24th–26th. Currently, 70 percent of the registered players are from Sweden, also known as “the V:TES Peoples Republic of Apache Jones” – hopefully YOU might want to contribute to change that quota! The weekend of April 28 no less than two VEG events are played, in Madrid, Spain, and in Budapest, Hungary. They count as one event for the purpose of collecting a “VEG points jackpot”. For the latest news about these tournaments, check out Grand Prix Ibérico and V:TES Hungarian Grand Prix. A while ago the V:EKN published rules for you to create your own, local storyline, not to be confused with the big, international storylines. Now we want to bring attention to one of these regional initiatives. The Australian community led by Stewart MacLeod (prince of Melbourne) and Steve Harris (NC) has launched Antipodean Awakening, a storyline format that focuses on Australian and New Zealand based Kindred and features of the region. It will be played during this spring and summer, erupting in a grand finale at the 2018 Australian/New Zealand Continental Championship event weekend. Antipodean Awakening contains 15 new library cards and 9 new crypt cards, each depicting one of the nine players who has won one or more Australian Continental Championships from 2002–2017, and is based on their winning deck and/or play style. Welcome to another part in our classic decks articles series, done in honour of the 20th anniversary of the Tournament Winning Deck Archive (TWDA). This time we examine the Kindred Spirits stealth-bleed deck archetype with the help of Sonam Adinolf and Selen Türkay, a couple of great New York players currently living in Australia. Henrik: Would you consider taking this deck archetype to a tournament 2018? Sonam: - I think the archetype as a whole has strengths to it. However, neither Selen nor I would consider taking it to a tournament, regardless of the metagame. It doesn't suit Selen's taste, as she either plays bruise bleed (a la euro-Brujah or Giovanni), or high risk-high reward (like weenie-Dem). Most of my (Sonam’s) decks fit into tap'n’bleed or bruise-bleed (or some hybrid), or vote. What are its ideal prey and predator? - For ideal predator bruise-bleed isn't too bad, since you've got access to bounce. You also have some combat denial to stymie a couple of rushes. For ideal prey maybe mid-cap presence bleed, like Setites or Baali. They soften up their prey, but they can't bounce you. What do you think is this deck archetype's weaknesses? What about worst prey and predator? - The archetype isn't very strong against heavy vote. Nor is it strong if there will be more than one or two rush decks to be found. It fares well against light to moderate intercept, due to it's obfuscate. It's oust/lunge is limited, unless you get "lucky" and have a dominate deck behind you to flick forward. Lucky is in quotes because it's just as likely the dominate deck will oust you. So a vote deck is a problematic predator. Depending on the table, and how aggressive the vote deck is, you might need to force them off the table with a couple of Kindred Spirits backwards. A problematic prey would be rush combat. You aren't a super fast deck, so you won't be ousting them before they get going. But you're dangerous enough to have them rush you backwards. The methuselah with two predators usually loses. What are the most obvious changes you would do to this classic version from 2002? - Well, 24 reaction cards is a lot. Get rid of Voice of Madness. It may have been ok at the time, but there's so many big caps around today I think the card is useless in a mid-cap deck. Also get rid of the Comas. You'll want to add a few No Trace for combat ends. If you're really enamoured of the idea of an Obedience-effect, use Mental Maze. It's just better. A couple of the wakes should be On the Qui Vives, the rest should be Eyes of Argus. Although it costs blood, you should replace the Telepathic Counters with Wrong and Crosswise. It still reduces bleed, but with random titles lying around, 4 votes can sometimes fail that crucial vote. Toss in a couple of Delaying Tactics as well. There's a whole lot of blood gain, with only Blood Dolls to recover. Either switch to Villeins, or get rid of some of the blood gain. Which brings us to: You might consider ditching the Sabbat tech, and going to the newer grouping. If you choose to stay Sabbat, toss in one or two Under Siege – it´s a good defense card. How do you play a deck of the type? - In spite of the fact that it's basically straight forward, I think you have to talk, or at least play the part of a super slow deck. You need time to use The Call to get cheaper vampires. Your only real lunge is Madman's Quill, which needs a bunch of vampires to be worthwhile. Do you have any recent personal experience with this deck type? - We tried a Danse Macabre version of this a while ago. Never really tuned it or had much success. Selen does excellently with weenie-Dem. That's a deck that destroys in situations it is suited to, and dies quickly otherwise. The closest deck to this I (Sonam) has is an Unmada multi-act deck. It did moderately well at the European Championship a couple of years ago, and at the Australian Championship this year. Normally, a modern suggestion is also to consider taking down the deck size a bit (proportionally in each card type category), maybe to 90 percent or so. But for this particular archetype that might prove hazardous – you might actually run out of cards if your preys are falling like dominoes and you go for the table sweep. So start big and test how big a deck you need to feel comfortable. For additional reading about this archetype, check out Extrala´s article “Deck Archetypes: Kindred Spirits Stealth Bleed”. Also, read part 1 of this article series, found in the January 2018 newsletter: The Ventrue Lawfirm.